To start of the process heat a pan with some coconut oil. While waiting for the pan and oil to heat, grab your bananas and peel team, placing them on a plate. Grab a fork and mash the bananas. Make sure you don't mash it into to small pieces or the pancake won't hold together. Next grab a bowl and place the mashed banana, cinnamon, baking powder all in one bowl. Grab the two eggs and crack them into the bowl with your banana mixture. Gently mix them together till it turns into a nice thick batter. Leave to stand for a couple of minutes. Now that the pan and oil is heated up, bring the bowl with your pancake batter and slowly pour some batter into the pan. You can make pancakes as big as you want. Once you've used up all your batter and your pancakes are done. Place them one by one on your plate. 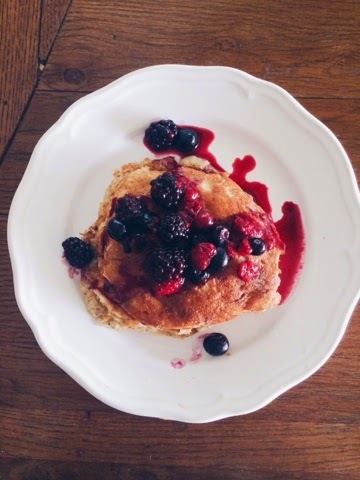 to finish off you can garnish your pancakes with some mixed berries, maple syrup or anything you desire.